In the wake of Hurricane Harvey our thoughts and prayers are with our friends and neighbors as we all attempt to get back on our feet and begin the long and difficult process of rebuilding. In the weeks ahead it is important that the proper precautions are taken to protect our health and our homes from mold and mildew. Improper restoration and sealing can lead to an unsightly appearance and even harm the structural integrity of homes and office buildings. Galveston Bay Paint & Decorating fully stocks all of the cleaning & restoration supplies that you need to help prevent mold, mildew, water staining, and warping so that you can begin the process of rebuilding on the right foot and ensure the safety of your family and the integrity of your home for years to come. When beginning the process of cleanup after a flood the most important step is properly dealing with mold, mildew, and bacterial growth. Not only are they unsightly but they pose a health risk to your family or your employees while also damaging the integrity of the structure. Flooding is already a financially stressful event and needing to completely tear down and repaint because of improper mold removal is the last thing that you will want to do. Galveston Bay Paint & Decorating has all of the fungicidal and germicidal cleaners that you need to eradicate mold and mildew that already exists and help prevent future growth from posing a threat. 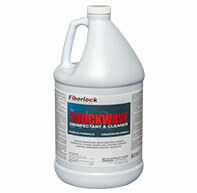 Shockwave is an EPA-registered disinfectant, sanitizer, and cleaner with fungicidal properties that can be used on porous and non-porous materials. 1 gallon of concentrate will yield 64 gallons of usable product. 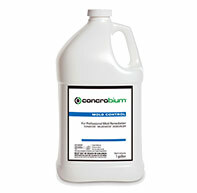 Concrobium Mold Control is an EPA-registered solution that eliminates and prevents mold without any harmful chemicals. 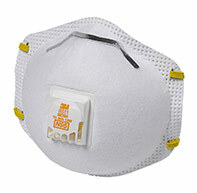 Used for mold cleanup and prevention, restoration, pre-treatment of building materials, and odor control. 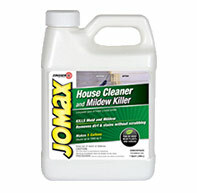 Jomax is a mildewcidal liquid house washing concentrate formulated to kill mold and mildew and remove dirt and stains from most exterior painted or non-porous surfaces without the need for scrubbing. 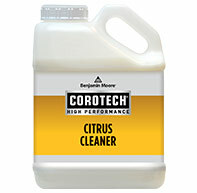 Corotech Citrus Cleaner is Benjamin Moore's citrus based biodegradable and phosphate-free multi purpose cleaner. Can be used to clean metals, masonry, painted surfaces, glass, upholstery, carpets, tile, plastics, and more. 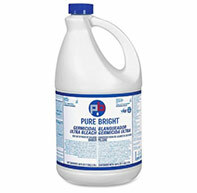 Pure Bright Ultra Bleach is industrial strength disinfectant for use on non-porous surfaces such as in kitchens and bathrooms, floors, sinks, vinyl, walls, tile, linoleum, and more. Once all of the mold, mildew, and bacteria has been properly removed it is important to begin with a good primer and/or sealer before you start painting. We carry a full line of primers and stain blockers for prepping areas that still maintain their integrity despite possibly having unsightly water stains. A proper primer will not only make repainting and staining easier but it will also help protect from future damage and fungal growth as a result of leftover moisture or future flooding. 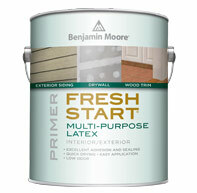 Fresh Start from Benjamin Moore combines high hiding, excellent adhesion, blister resistance, quick dry, splatter proof, and minimal odor with excellent flow and leveling in a 10% acrylic interior or exterior primer. 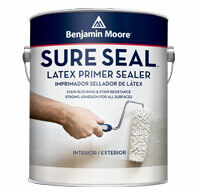 Sure Seal Latex primer from Benjamin Moore is is a multi-surface acrylic primer for interior and exterior applications. It is ideal for covering up water stains, tannin bleed, smoke damage, and other common household stains on new or previously painted interior and exterior surfaces. 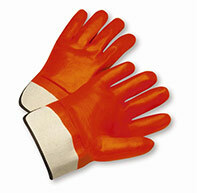 Additionally, it helps block future stains while also providing a mildew resistant coating. 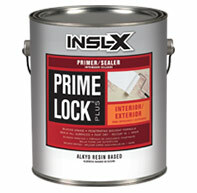 Insl-X is a resin based alkyd primer, sealer, & Stain Blocker. It's superior coverage properties make Insl-X ideally suited for covering up heavily water or smoke damaged surfaces that are otherwise structurally sound. 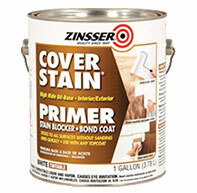 Zinsser Cover Stain Primer is an oil based primer for interior and exterior applications. It offers superior coverage to hide water and fire damage along with excellent adhesion to dense, glossy surfaces such as on enamel paints and varnishes, paneling, laminates, and ceramic tile without the need for sanding or de-glossing. 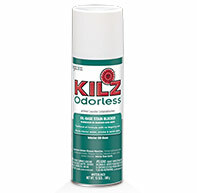 Kilz Odorless stain blocker is an oil-based aerosol primer that is fast drying and offers superior stain blocking. Ideal for spot priming and direct application to furniture, molding, baseboards, door jambs and frames and other projects where a "focused application" is desired instead of a large flat surface. It is important to protect yourself when undertaking any cleanup job but it is especially important when potentially dealing with mold and mildew. Proper steps and equipment should be utilized to not only protect yourself, but also protect against potential contamination with undamaged areas. Galveston Bay Paint & Decorating fully stocks disposable and refillable respirators, gloves, shoe coverings, and body suits to keep you safe while you tackle the job. 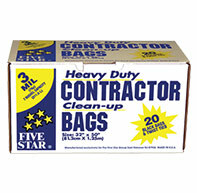 We also have all of the cleanup bags, drop cloths, and disposable towels to ensure that cleanup is a breeze.